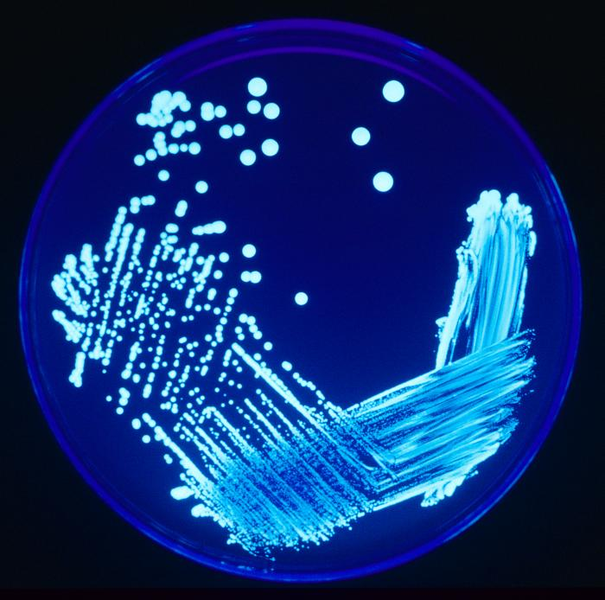 Legionella is a genus of facultative anaerobic bacteria, which are gram negative rods. • Airborne droplets but person-to-person spread does not occur. Pathogenesis is not fully understood. Primary pathologic changes occur in the lungs. Bacteremia may occur as well. Damage to the vascular endothelium, especially the brain and kidneys, takes place. No exotoxin is produced. Major damage is by the lipopolysaccharide, which serves as endotoxin. As legionella are facultative intracellular bacteria, so they survive in phagocytes and in alveolar macrophages. They prevent the fusion of phagosomas and produce a toxin that blocks the oxidative burst. These bacteria are not easily stained. Sputum gram stain shows many neutrophils but no bacteria. Legionella species growing on agar plate illuminated using ultraviolet light to increase contrast. As produce B-lactamase so this needs to be taken into account as well. No vaccine is available.